Here at The Wheel Works we understand that it is all too easy to damage your alloys whether it’s rushing to pick the kids up from school, reversing into a tight spot, moving across for the emergency services vehicle coming up behind you… All of these scenarios can leave your beautiful alloys looking far from their best. We have recently invested £200,000 in new state-of-the-art equipment including a powder coating facility and a diamond cut alloy wheel lathe. Our specially trained technicians will assess your wheels and provide a cost* and an estimated time frame for the refurbishment to be carried out, this will be subject to the extent of the damage. 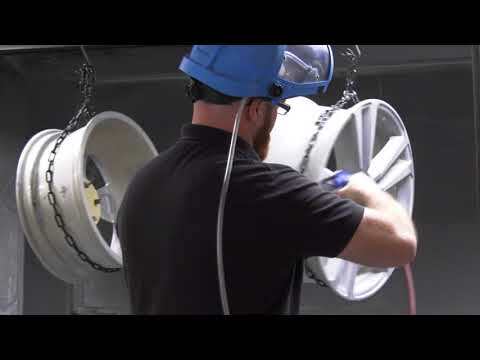 Take a look at our Wheel Works video to see what is involved in the process! How do you refurbish alloy wheels? Your wheel will now be treated accordingly dependent on if it is needing to be treated for light damage or large damage and also if it is Matt Finish or Diamond Cut Finish. *Alloy Wheel Refurbishment from £100 per wheel. We can customise your alloys to any bespoke colour combination you wish using our state of the art equipment.If you have something in mind, simply speak to one of our Wheel Work expert technicians and we can provide you with a quote. We offer a colour matching service so that we can match any colour you require for your wheels. Whilst we're repairing or refurbishing your alloys we will also check your tyres and if we think they need replacing, we will let you know. For your peace of mind, we offer a 12 month workmanship guarantee with all the work that we do. *Does not cover external influences e.g. cleaning chemicals or stone chipping.